The nineteen principal departmental heads in the Food Administration are all specialists, none of whom would be able to advise you generally as to food matters outside of their special problems. Moreover, I am completely non-plussed to know which of them to suggest to you to attend the Wednesday conference and, furthermore, I dislike to show a preference between them in this matter. 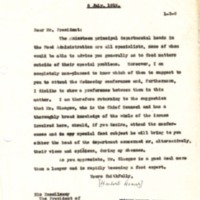 I am therefore returning to the suggestion that Mr. Glasgow, who is the Chief Counsel and has a thoroughly broad knowledge of the whole of the issues involved here, should, if you desire, attend the conferences and ion speany special food subject he will bring to you either the head of the department concerned or, alternatively, their views and opinions, during my absence. As you appreciate, Mr. Glasgow is a good deal more than a lawyer and is rapidly becoming a food expert. Hoover, Herbert, 1874-1964, “Herbert Hoover to Woodrow Wilson,” 1918 July 8, WWP19458, Hoover Institute at Stanford University Collection, Woodrow Wilson Presidential Library & Museum, Staunton, Virginia.